THE Combined Book Exhibit® is one of the most widely recognized and highly respected names in the publishing community. For almost 75 years, CBE has been showcasing published works at national and now international book shows and expos, becoming a dependable resource for the publishers it serves, and the librarians and educators who depend on it. THE COMBINED BOOK EXHIBIT’S® reputation with publishers has helped it grow into one of the biggest—if not the biggest—exhibitor at each show it attends, while it’s reputation with educators and librarians makes it one of the busiest. 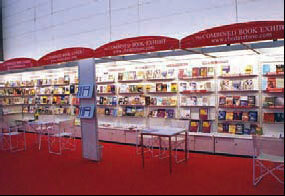 THE Combined Book Exhibit® is showcased at most high-volume and highly active state and regional library conferences in the U.S. CBE also attends (as both an exhibit and a partner) the largest English-speaking trade fair in the U.S, BookExpo America, as well as major international venues in London, Frankfurt and Beijing. Prices are listed per title. June 21- June 24, 2019, Washington D.C.